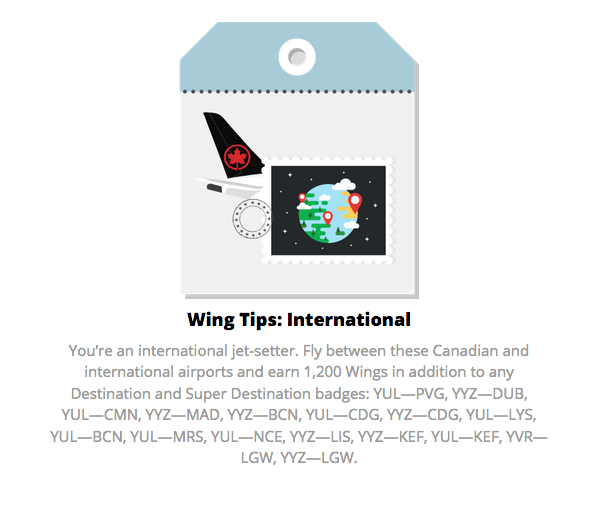 Today the 6th Edition of Air Canada's Earn Your Wings launched and like the previous three editions, it is strictly for Air Canada Altitude members. This edition runs similar to the past three as well. 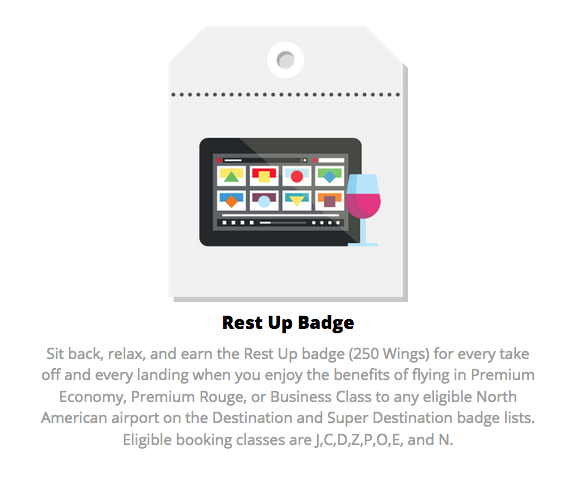 Like last year, this year's offer only awards badges for flying and badges equate to Wings which are the currency for this promotion. Compared to previous this year's Earn Your Wings has many more airports where you can earn badges! A total of 94 airports are available with higher amount of wings compared to 79 in 2016 and the 67 seen in 2015. Of course 3 of Air Canada's biggest airports aren't included and those are Vancouver, Calgary and Toronto - that would be too easy but you'll still get 100 wings for take off and landings here. Montreal is bonus destination badge so that should be a really easy badge to grab. Your first 500 Wings are super easy as they are awarded just for registering for Earn Your Wings. 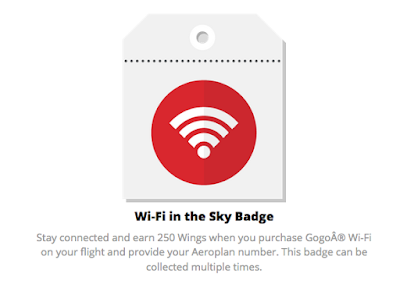 Earn a minimum of 100 Wings for every takeoff and for every landing on any Air Canada flight (including flights operated under the Air Canada Express brand) and Air Canada Rouge. This translates to a minimum of 200 Wings per flight segment. There are 94 airports that will earn a higher amount of Wings for every takeoff and every landing. Refer to the list of cities that will earn Destination badges and Super Destination badges. Earn extra Wings by collecting badges (see Collect Badges). Finish in the Top 10 and earn your equal share of 10,000,000 Bonus Aeroplan Miles. 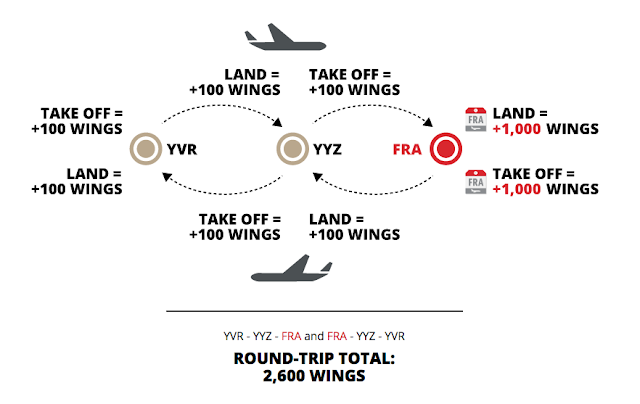 Finish between positions 11–30 and you’ll earn your equal share of another 10,000,000 Bonus Aeroplan Miles. Finish between positions 31 and 50 and earn an equal share of 1,000 eUpgrade Credits. To participate in Earn Your Wings you must be an Air Canada Altitude member and register online at: https://earnyourwings.aircanada.com/en by Oct 11th. Flights booked between Sep 7 and Oct 11th that are completed by Dec 11th will count towards earning your wings. • Book flights within Canada or to destinations around the world for a fixed amount of points, with the Fixed Points Travel Program. You can book any airline , fly any day, and even book right up to a day before departure. • As a Charge Card, the balance must always be paid in full each month. 30% annual interest rate applies to balances not paid in full. Payments must be received and processed by the date of the next monthly statement to avoid interest charges. • *American Express is not responsible for maintaining or monitoring the accuracy of information on this website. For full details and current product information click the Apply now link. Conditions apply.